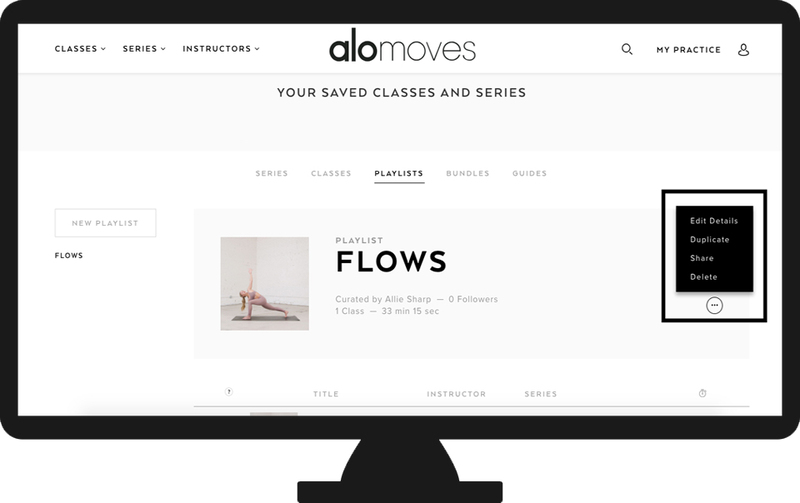 How do I create a Playlist on Alo Moves? 1. 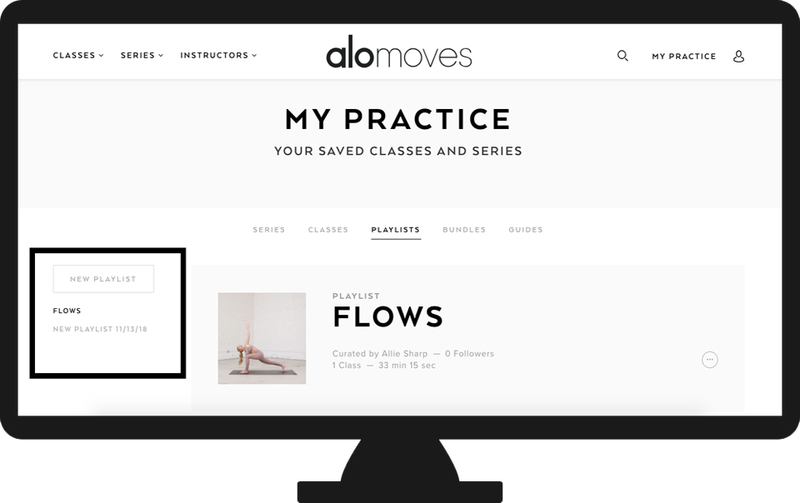 Head to your Practice and click on the new Playlists tab to create and name your playlist. 2. Once you are in your Playlists tab, select the New Playlist button to the left of your screen and give your playlist a name! 3. After you create and name your Playlist, it will be saved to your Practice and you'll be ready to start adding your favorite series and classes. To add to your playlist, first find a series or class by either directly searching for the workout in the Explore bar, or browsing in the Series and Classes tabs in the top left corner of the screen. 4. Once you find your series or class of choice, hover over the Add to My Practice button. You'll see a new feature which allows you to either save to your Practice, add to an existing playlist, or create a new playlist directly from here. Select the Playlist you want your workout on and it will be added immediately! 5. Head back to your Practice to view your new playlist! You'll be able to manage your playlists to the left of your screen under the Create New Playlist button. Select the playlist of your choice, and get your flow on! 6. Need to change something about your Playlist? No problem- to edit your playlists, just select the circle with three dots icon at the top of your playlist next to the title. Here you'll be able to edit, share, duplicate and delete your playlists at anytime. In the Edit Details section you'll find you are able to rename your playlist, set it as public or private, add a description, and even choose your own cover photo! You can also Share your playlists on your Profile to connect with your Alo Moves community, and follow others as well! If you need further assistance, send us an email and we'll be with you shortly.